Oregon State heads to Tucson off a season high performance at home last week versus UCLA, and I’m fascinated to see how the Beavers’ scores hold up on the road. 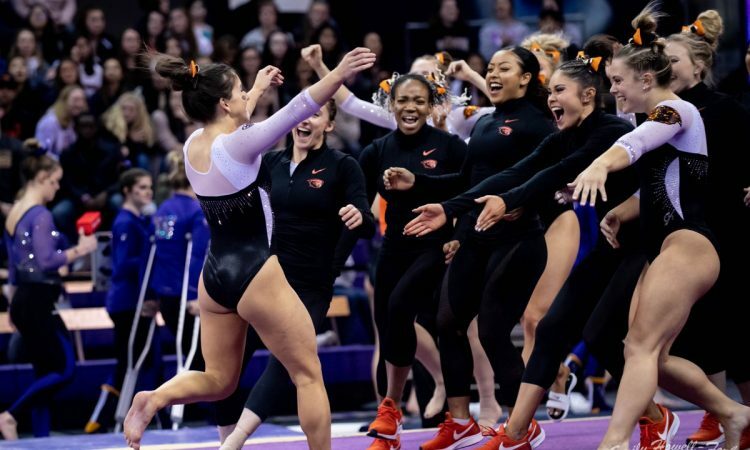 The typically generous numbers in Gill turned ludicrous during a frankly fairly sloppy floor rotation, so it’s completely possible that the Beavers will turn in a significantly worse score for a better meet today. Arizona has been quietly solid this year after a difficult 2018, and while it would take mistakes from Oregon State for the Wildcats to sneak a win, it wouldn’t be without precedent: They upset California just two weeks ago on home floor. Also, we’re still on Payton Bellows watch, but Arizona is thriving without her this year. PARKS – UA: Twisting on on a tuck FTY, hop back. YAMAOKA – OSU: Toe to Maloney, bail a bit crunched, blind full and falls out of it to a double back. She’ll get hit on the late turn there. LEUNG – UA: Solid full. A little soft onto the table but acceptable body position with a hop back. JACOBSEN – OSU: Tkachev with usual feet to overshoot, catches it still twisting but works through, blind to double front with a big arm swing but stuck. COWLES – UA: Yurchenko full… solid start, gets weird at the end. She split her legs out and landed short and a bit lock legged. Hop forward. LOWERY – OSU: Toe to Maloney, dynamics are off, to Pak. Bends at the elbows in a handstand but pushes back up and keeps going, super impressive! Double lay is deep, probably underrotated though this isn’t the best angle to see it, big hop forward. LEYDIN – UA: ONE AND A HALF WHAT???? So exciting to see that make it to competition. Couple of quick steps but great. MCP – OSU: Jaeger really nice, double lay with a hop. SWANSON – OSU: Twists on a bit but solid body position in her full, hop back. 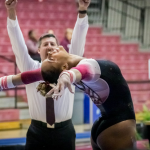 BRISCOE – OSU: Off on her first handstand, kips again, jumps off. Blind to Jaeger, solid, okay bail. Double lay with her chest down but stuck. KANE – UA: Leg split on the block, tuck full is okay with a hop back. 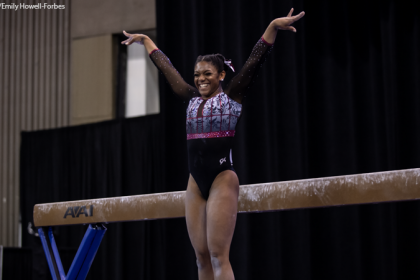 GILL – OSU: 2019 debut on bars, she’s had some injuries but she’s desperately needed here. Maloney is good, leg sep on her pak, looks a little off on the low bar but works through. Double lay with a small hop back. Good! Yanish in the exo for OSU. Half turn to bail to toe shoot, double lay. Well that wasn’t great. Arizona vault is always a bit of a nightmare, the Cats won’t be mad about that score, but Oregon State had some mistakes on routines it really needed. Gill returning in the anchor is a gift, though. I don’t know if it was a 9.9 routine but it was a desperately needed one. FORCE – OSU: Full, block is off… piked way down and falls forward onto her hands. HENDRICKSON – UA: Blind to Jaeger to overshoot, GREAT. FTDLO with a step back. So good especially for a lead. Hopefully the scores that the judges put up for a fairly sloppy OSU rotation will force their hand about the better UA routines. 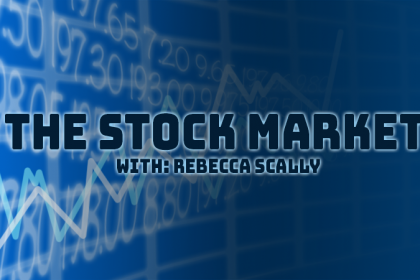 SINGLEY – OSU: Full, piked throughout and not too high but stuck! 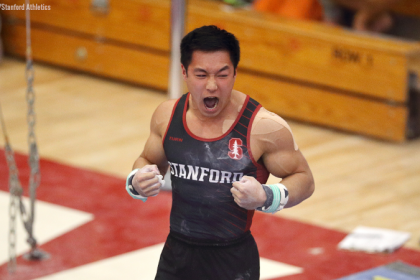 SWANSON – UA: Full turn to Tkachev, misses a handstand, Pak is archy with leg sep, whippy double lay with a small hop. L. DAGEN – OSU: Full also pikey… that’s not usual for her. Lands weirdly still twisting with a cross step forward. Not disastrous but awkward. KANE – UA: Blind to Jaeger, great. Blind to straddle back, handstands are great, blind is late to double front… over and dives forward. Keeps her hands off the ground but two very big steps. M. DAGEN – OSU: Best full of the lot, stuck! Not much amplitude but body position is there. LEYDIN – UA: Toe on to Pak, beautiful, switch kip. Hitting handstands, blind to Markelov and one leg is a touch low but it’s okay. Blind full double back with the tiniest hop in place. Really nice! YANISH – OSU: Feels soft on the table here but nice in the air, flares it, hop back. SPENCER – UA: Ray with bent elbows, toe on to bail beautiful. Double lay isn’t super high but clean with a hop back. JACOBSEN – OSU: Tsuk full, lower than her usual and never really laid out, hop back. BERG – UA: Pike Jaeger to overshoot, huge and gorgeous, FTDB SO high with a little hop. Two sticks help the Beavers a lot on vault, but this meet is still definitely live. OSU is off its game and Arizona is strong on floor. Excited to see how it pans out. LEYDIN – UA: Wolf turn, bit of a lean forward, switch split with questionable positions. BHS LOSO, leg up check, hitch kick side somi. Pike jump back tuck, one and a half twist with a midsize hop back. JACOBSEN – OSU: Double pike with a weird hop. One and a half front lay, I love the backward roll pass in this routine so much, great Rudi. LEUNG – UA: BHS LOSO, really pretty, full turn. Switch switch is a little short, cat leap side aerial with a leg up check. One and a half twist with truly wild legs and a step… I think, I was distracted by the legs. M. DAGEN – OSU: Double back, back with a double pike, SO much better than last week, front lay front full. If last week was a 9.925 that was a 10.3. DAVIS – UA: BHS BHS LOSO beautiful. Right up to the end of the beam, but I’ve watched her enough now to know that’s normal. Split split quarter, cat leap kickover front, arm circle and a lean to stay on. Full turn and a one and a half dismount with a hop straight forward. SINGLEY – OSU: Front thru double back, great. Some archery component, double pike WAY low with a big step forward, unclear whether her back knee went down. Switch ring switch half, good Rudi but looks preoccupied. FREIDIN – UA: BHS LOSO with major feet, usual for her, switch beat. Side aerial or something with a lean, switch half solid, gainer pike with a hop back. I love the way she does that dismount – flings her arms out and really looks like she’s flying. FORCE – OSU: Double pike, switch side Popa beautiful, I’m always missing her front pass but the double back at the end was great. HENDRICKSON – UA: BHS LOSO, feet, full turn good. Some other stuff that I forgot to write about, stuck gainer full. Great! The Cats needed to clean up and that’ll do it. LOWERY -OSU:: Front double full, awkward little step, front full front lay really solid. On the landings today. Rudi lands twisting a touch but that seems usual, awesome crown moment to finish. COWLES – UA: Cat leap front aerial to beat, beautiful, full turn, BHS LOSO right in line. Switch split looks short but this is the worst angle to tell, gainer front full off the end stuck-ish. NICE. YANISH – OSU: Double lay, little stumble in place that she resolves into a lunge. Isn’t used to landing that one on top of herself. Front full front lay, Switch side Popa. Double pike a bit overpowered, pulls the front foot back. That’s more her usual. Parks and Mack in the exhibition. Good hits from both. Ooooh and a surprise second exhibition from Kristina Peterson! She’s so adorable. Arizona gave up the chase a little there, a midsize check on almost every routine added up. Oregon State was great on floor as usual. SINGLEY – OSU: Switch double stag, BHS LOSO a bit off line but mostly controls it. Kickover front good, gainer full with a little scoot back. HENDRICKSON – UA: Double back, front full a bit crunched to front pike. One and a half Barani punch front, switch wolf full. M. DAGEN – OSU: BHS LOSO, tiny bit too much gas and almost pulls the front foot up but it’s okay. Switch switch half, way short. Side aerial back full stuck. Nice! SWANSON – UA: Front thru 5/2 twist, really nice. Double back, lands a bit staggered but works it out, switch side Popa. Double full punch front. YANISH – OSU: BHS LOSO, switch? to LOSO, this routine is getting away from me lol. Something switch side, bend check on her token front walkover, gainer full stuck. FREIDIN – UA: Pink Panther routine! Very on-theme for this meet. Tour jete half with a half turn out, I think we’re meant to believe it was a full but it wasn’t. Double back, big step back and out, she never kicked out and didn’t seem to know where she was. More leaps, was that a switch full?, her dance is great. Front lay front full, two steps OOB. Whoopsie. GILL – OSU: Full turn, split double stag with a check, front aerial BHS great. Switch half beat is really pretty! Her choreo is really intricate this year. Gainer full with a hop forward. COWLES – UA: Double back, big lunge out, front lay front full. switch ring tour jete half, sorry I got distracted but it was good. I think Freidin might have lost credit for that first turning leap. Her 9.3 is low even with the landing errors. If I misidentified the second one (totally possible) and she got credited with two tour jete halfs that would be a problem. L. DAGEN – OSU: BHS LOSO great, full turn. I think both Dagen sisters do beam to Beyonce. Gainer full with a little hop. She looks thrilled. LEYDIN – UA: Front thru double back, little shuffle into lunge, switch side split full. Tour jete half Popa, double pike is just under with a step forward. LAZARO – OSU: BHS LOSO, stumbles, falls. That’s not her style. Switch straddle 3/4, another big check. Side aerial back full with a little adjustment. BERG – UA: Front double full goes a little sideways but really nice controlled landing. Switch to split full wolf full, one and a half front pike. Rudi to straddle I think?? to close, traveling backwards, couple of steps to try to control it but stays in bounds. MCP in the exhibition for OSU. Parks for UA. That’s MUCH more like what Oregon State is actually looking like. Solid night for Arizona too. A few stumbles counted for both teams, but the Pac-12 on the whole is looking really solid for early February.